After World War II, the youth of America found a newfound freedom with the popularity of automobiles. Now youngsters could borrow the family car, or even better, buy one for themselves, and start searching for excitement. In the late 1940s, a new phenomena sprang up across America – the drive-in restaurant. Now teenagers with wheels could cruise the local drive-ins looking for friends and excitement. 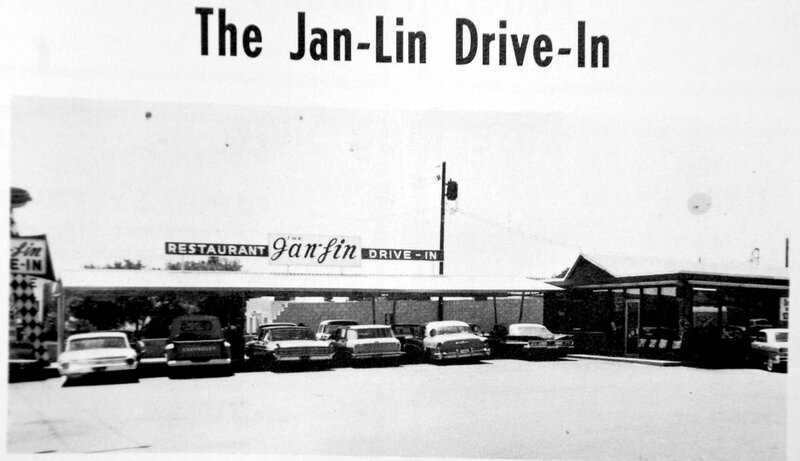 During the 1950s, and early 1960s, Jack’s Drive In was one of the most popular eating places and hangouts in Rogers. It was located on Highway 71 (412 S. Eighth Street) just south of the old Foodtown Grocery. In October 1961, Jack’s became Milly’s Drive Inn owned by Mildred and Earl Jones. The restaurant appears to have closed around1962, the year the Jan-Lin Drive-In opened further down the street on S. Eighth. In April 1951, the Dairy Queen opened at 225 S. Eighth Street by Mr. and Mrs. Frank Neal. In 1952, the restaurant celebrated Dairy Queen’s birthday by offering big ice cream sundaes for 12¢. (I’ll bet many local citizens gained a few pounds.) Glen Pickel shared his memory of the Dairy Queen Drive-In on a popular Rogers’ web site: “I think the Dairy Queen was the first. I believe they had the first pizzas in Rogers – very primitive. It didn’t work out too well, but the ice cream was great.” By the mid-1960s, the restaurant had become Ness’s Dairy House and operated at least until 1970. Another popular drive-in in the 1950s through 1980s, was the Dari-Delite at 604 W. Walnut. A student did not even have to drive to this popular hang-out as it was just a few feet from Rogers High School. The Dari-Delite was located west of the old high school on Walnut just across Sixth Street. The restaurant was always crowded with students, and in 1966, you could get a cheese burger, foot long chili dog or a jumbo malt for 19¢. About 1970, after the school was torn down, the business became the Dari-Creme. In June 1960, Mildred Head opened the Susie Q Malt Shop downtown, and her niece, Patsy Head Simmons was there to help her serve the very first cone of ice cream. Tamra Potter-Mott shared her memory of the Susie Q on the Friends of the Rogers Historical Museum Facebook site: “Going to the Susie Q was a treat for us. We loved their cherry cokes and curly fries.” The drive-in at the corner of N. Second and Locust Street (Highway 12) is the only surviving 1960s era drive-in restaurant and has continued in Rogers for 57 years. 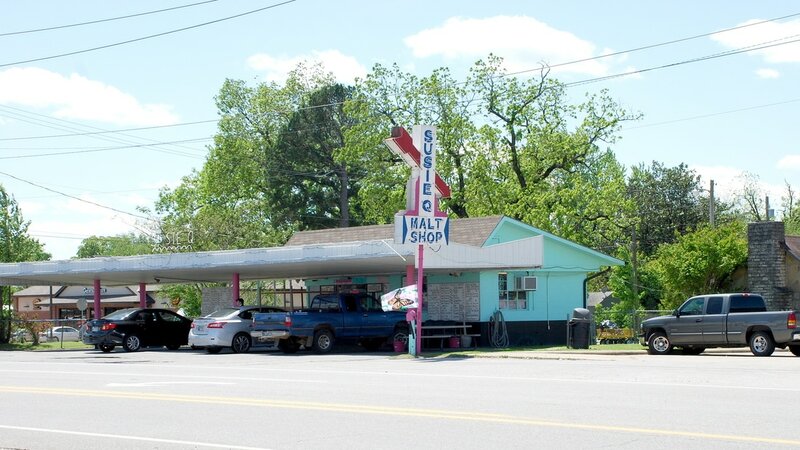 Not only has the Susie Q stayed the same since 1960, but the ownership has stayed in the Head family. Mildred Head handed over the reigns to her son, J. B. Head, in 1972, but continued to work in the restaurant until she was 87 years old. J. B. Head sold the business to his childhood friend and cousin, Patsy Head Simmons, in 2004 and she still owns it today. For the past few years, the still-popular spot has been leased and managed by Sheila Williams. The start of the1960s decade brought remarkable growth and exciting changes for Rogers. For the preceding thirty years, Rogers had little growth and was a quiet, Mayberry-like, Ozark town. Then Daisy Manufacturing came to town in 1958, and Beaver Dam was started in 1962. The new Highway 12 Bridge was under construction and opened in August 1963. These events brought good high-paying jobs to Rogers and started the amazing growth and progress that continues today. Also, in the fall of 1961, classes started in the new high school on Mountie Boulevard (now Heritage High School). In the early 1960s, drive-in restaurants were opening on Highway 71 along with many other businesses as commerce started moving away from downtown to areas with more parking and easy access. Kenneth & Verna Phillips opened the Besi-Dream in early 1963 at the northwest corner of 8th and Walnut, just west of Rife Variety. In 1966, the Besi-Dream advertised a hamburger, French fries, or milk shake for only 15¢, or you could get a whole catfish dinner for 99¢. Ken and Verna’s daughter, Kennita Phillips Rakes, recently posted on Facebook: “My parents sold the Besi-Dream to my grandparents, and I bought it from them in the mid 1970s. I sold it to the owner of the Besi Dream from Springdale after a couple of years. My mom has several homecoming pictures from the kitchen as most of the court worked there including Kathy Fairchild and Donna Umholtz.” Donna Knox remembered, “I worked at Besi-Dream all through high school. Verna Mae Phillips taught us, disciplined, and molded her girls into fine employees with great work ethic.” Kathy Collins posted on the Facebook site, Rogers AR History Club, “My favorite memory of the Besi-Dream is Dirkie Wilson taking the whole bus load of us kids to Besi-Dream at the end of the school year. That was a huge treat.” The drive-in stayed open into the early 1980s when it was torn down to widen 8th Street. Up until that time, South 8th Street did not line up with N. 8th Street as it crossed Walnut. The site of the Besi-Dream is now part of N. 8th Street. The A&W Root Beer drive-in had its grand opening in August, 1962 and operated throughout the 1960s at 809 W. Poplar, the location is now part of the parking lot in front of the old Smoking Joe’s Ribhouse. ​ The building that was once the Jan-Lin Drive-In and the center of teenage culture is still functioning as a child care facility at 1602 S. Eighth Street in front of Southgate Shopping Center. As I drive down S. Eighth Street today, I cannot help but glance over at the child care center and have visions of teenagers circling the building in ’57 Chevys, laughing and shouting at their friends, and enjoying life in a carefree world. ​Free Book for a limited time to the first 25 new members who join the Friends in 2016. In addition to the regular benefits and gifts for new members, now you can get a free copy of The Lost Town of Monte Ne by James Hales. This book sells for $11.99 and is the story of the fabulous resort town beneath the waters of Beaver Lake, and a guide to the historic sites that can be seen today. This popular book is in its second printing with hundreds of historic pictures. Click /Here to join. ​Note: You must pick up your free copy at the Rogers Historical Museum, 322 S. Second Street, Rogers, AR. Just join the Friends online or at the Museum and come by to pick up your free book. Enjoy your trip back to the Lost Town of Monte Ne. Thank you for your support of preserving our priceless heritage.